Lock & Encrypt any folder in seconds. Password-protect all your USB devices. Lock,Scramble and Encrypt Folder. Depending on the security level you need. Using the Strong protection technology that can effectively lock all your files. Protect your portable devices like USB flash disk and removable hard disk. Protected folder are totally hidden and undeletable, and totally inaccessible. With Folder Protector encryption option, secret files are highly secure. It uses 256-bit Blowfish Encryption which is a highly secure method to protect sensitive files. Does it work on Windows Vista/2003 Server/XP/2000/NT/Me/98? Yes. 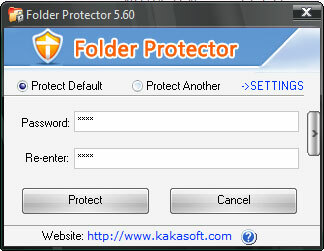 KaKa Folder Protector can be used on Windows Vista/2003/XP/2000/NT/ME/98. "The application is extremely easy to use and strightforward interface. Simply enter your password twice and click "OK", then the folders were locked." "I am really impressed with this software. What I can say is that it make me feel safe now..."
"The program is a dream for any Windows user. Absolutely fantastic. Easy to use. That was incredible."